Not ready to get a quote? We compare up to 10 of Australia's leading life insurance companies. We make applying for cover easy! Apply over the phone now. After months of meticulous planning and years of daydreaming you’ve finally been approved for a home loan. You move in and start decorating, filling each space with beloved knickknacks. The mortgage repayments are high, but you’ve budgeted, you feel confident. Out shopping one morning, a newspaper headline catches your eye: “Property price surge could lead to mortgage defaults”. The risk of mortgage defaults are on the rise in Australia due to a drastic decline in housing affordability. 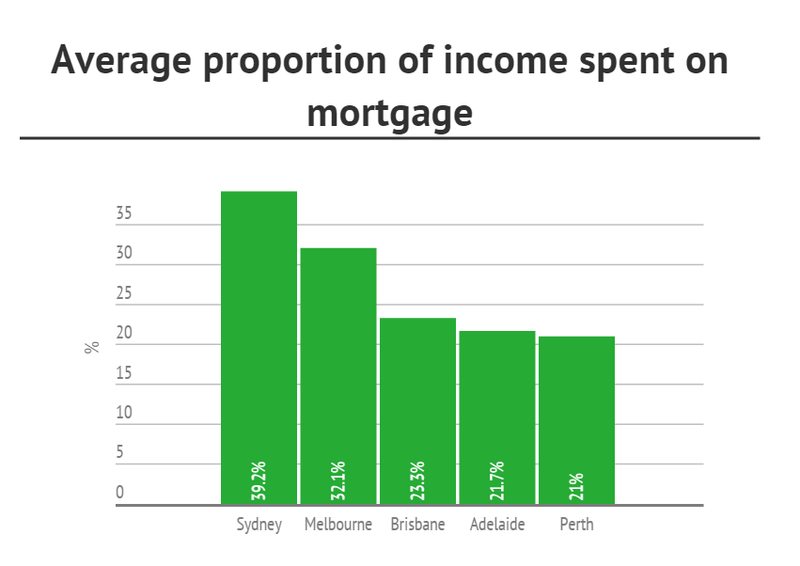 It’s not just Sydney and Melbourne feeling the financial pressure, a wide geographic spread of suburbs across the country are struggling to pay their monthly mortgage with the percentage of income required to meet these increasing repayments. When the budget starts to get tight or unexpected expenses occur we realise that your first instinct will be to start cutting costs in order to continue making those monthly payments. That’s a good idea, however what you sacrifice must not jeopardise your long term personal or financial wellbeing. Life and income protection insurance should never be on your list of luxury items to cut. What is Income Protection (IP)? This type of insurance covers up to 75% of your salary should you be unable to work due to sickness or an accident. A useful product if you don’t want to fall behind with monthly outgoings, such as your mortgage payments. Creating a buffer of protection against loss of income is essential to you being able to continue paying your home loan. Unfortunately, income protection premiums are also trending up. Understandably, that puts even more pressure on you. To help ease the burden we’ve compiled a list of tips for managing your cover premiums. you have sufficient disposable funds available, either in your bank account or offset account, to cover you for the extended period you’re without income. Did you know: Changing your waiting period from 30 to 90 days can reduce your premiums by 30 – 50%, enabling you to afford your monthly insurance premiums and while this option does not suit everyone it is better than having no income protection insurance cover at all & can free up additional funds to assist with other bill while still providing protection to you and your family.. Most life insurance companies will allow your income protection policies to be taken out through your super fund as salary continuance. When taking out cover through this fund, your premiums will be paid for by your super fund, freeing up cash flow and potentially making your cover more affordable. *Note: Before you take out a policy, make sure you’re aware of the condition of release issues surrounding your monthly benefit, thus ensuring such a policy actually suits your requirements. Splitting your Income protection policy ownership between superannuation and outside super allows for some advantages. Your superfund pays for the majority of the premiums, while the partial and ancillary benefits are funded by you (outside of Super). This helps to reduce the amount you need to pay from your personal accounts while making it easier to access your partial & ancillary benefits, which might not be available had you elected to fund the entire policy though super. *Note: Before taking up any of the following options ensure you know all the Pro’s and Cons of all options and to ensure that you select the option that meets your requirements, everyone is different and you should consider these before deciding which option to consider if you are finding your premiums becoming unaffordable. Try one or more of these tips to help you manage your premiums and rather be inspired by below cost saving strategies when deciding how and where to cut costs. Purchase non-perishables in bulk. It might not be cool to have a cupboard stocked with toilet paper and baby wipes, but it sure is a great way to save. Buy the unbranded products at supermarket. They’re just as good, but their packaging isn’t as fancy. Use public transportation and save money on gas, parking, and maintenance over time. Alternatively, get your colleagues involved and start a carpool. Loose the takeaway coffee(s). This is a luxury purchase and will taste just as good homemade and poured into a nice flask. Switch to energy-efficient light bulbs. They use two-thirds less energy than normal bulbs and last 10 times longer. Cancel unused subscriptions. This includes those magazines you never read and the TV channels you don’t watch. Don’t eat out as much. This might sound obvious, but the temptation to grab a quick lunch and catch up with a friend can be very tempting. Go old school and clip coupons. Look in your Sunday papers and search for them online. We know it’s difficult to forego some luxury items, but your income protection cover should never be one of those items. The probability of a sickness or an accident happening to you is too high, which could well lead to you not being able to continue to make mortgage payments. Don’t risk it, it is not worth it! Understanding your obligations and providing accurate information during the life insurance policy application process is crucial! A 5% discount applies to RACV members, and spouses who take out a new insurance policy from any of AMP Elevate (Life, TPD or Trauma insurance) policies. Can I take out Life insurance if I am an Australian expat living overseas? Generally in order to take out life insurance or a related life insurance product you need to be an Australian permanent resident or citizen. We’ve developed 5 steps you can take today to provide you and your loved ones with more certainty that your life insurance policy will pay your claim. We answer the top 10 life insurance questions we get asked every day. These will help most people however feel free to ask us any others you would like to know. Save on your life insurance! Don’t pay more than you need to and learn how you can save! Stop smoking, apply early and know what level of cover you need! 3rd party images, logos and trademarks are copyright by their respective owners © All other content copyright 2019 by Life Insurance Direct Australia.